PSL Imperial Empire Pottery Mark:- I have several 6" plates that were given to me by a neighbor when I was a little girl. I'm guessing the plates are from the 1800's and was wondering if you can tell me what the PSL pottery mark is? The factory is "Imperial PSL Empire". Also known as "Imperial Austria" and PUL. The PSL refers to the Pfeiffer & Lowenstein Factory of Schlackenwerth, Bohemia, Austria. The PUL refers to Pfeiffer & Lowenstein (u being the shortened version of 'and' in German). Some of the marks are just PL. Founded in 1873 by Ludwig Lowenstein in Ostrov, Czech Republic (then Schlackenwerth, Bohemia Austria), the factory was managed by Josef Pfeiffer Jr in the 1900's, and was renamed Pfeiffer & Lowenstein. In 1938 the Nazis seized the factory and renamed it Porcelain Factory Schlackenwerth Josef Pfeiffer. Finally, after the war, the owners were Luise & Wilhelm Pfeiffer and George von Hoffmann until it closed in 1949. I have a mug with the Imperial (PSL) Austria seal plus, date of 12/15, 1913. plus,F.V.V. on bottom plus, gold letter maybe I or J on side plus, gold on handle and rim of cup/mug. can you tell me anything about this item? www.collectorscircle.com for more on this company. Go to my vintage and antique china values page for value help. I was glad to find this information about this PSL pottery mark and style as I have hunted for it for a long time. My husband and I were given a complete dinnerware set that is the pfe10 style. It is a service for 12 and includes butter pats, fruit bowls, bread plates, dinner plates, soup bowls, cups and saucers as well as multiple other serving pieces including several covered dishes. I am still searching for a value or even any other pieces. I had a late Aunt that owned an antique shop. She gave me a vase (short with a wide mouth) that has the name Mary Williams 1914 on it. The vase is a golden color, the top of the vase is a lighter brown. It has pine cones and pine needles around the entire vase. Can you tell me anything about it? I was gifted a children's porcelain drinking cup 40 years ago. The cup was found inside the wall of an 1880's built hotel in a small town in Leicester, NY. The cup has the PSL porcelain company mark on the bottom that was used from about 1914 to 1918. It says IMPERIAL then a crown sitting above PSL, then ALMA, AUSTRIA. It is glazed a soft yellow glaze, with a light brown band (about 3/4 inch) around the top. The band is hand painted with a black line on which outlines it and hand painted yellow baby chicks outlined in black. I would be appreciative of any information about children's cups. Josef Pfeiffer was my great grandfather. I'm doing research for a family tree and I came across this post. In case you're wondering, after 1938 his family immigrated to New York City to escape WWII. Over the years my family has collected a few of their pieces. I hope you enjoy yours! Many thanks for your post, and welcome!! We would love for you to post more information on your family's business. 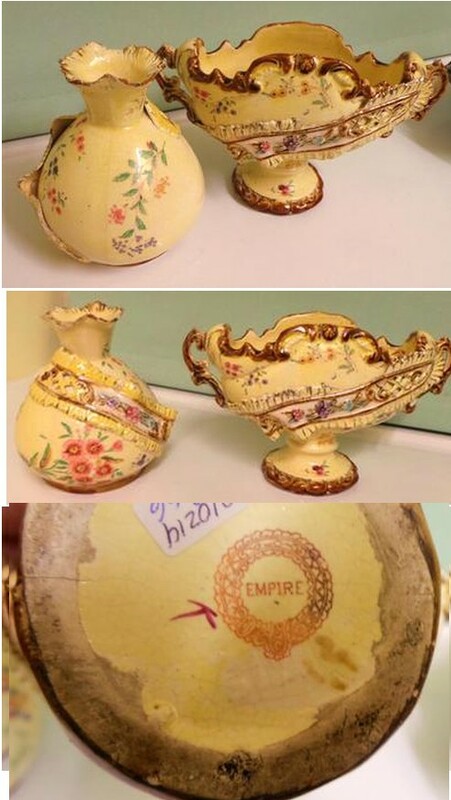 Hi I just bought an imperial PSL piece that has the words "imperial PSL" stamped on it with the crown but does not have the word "Austria" below as I have seen on other pieces. They were painted by an artist who signed their name as "Dooley" but I can't seem to find any record of this painter. Has anyone seen an imperial PSL piece with this particular mark that does not bear the word "Austria" and does anyone know an artist named "Dooley"? Also, are these pieces often counterfeited? I don't know much about antiques or how coveted this particular brand is...any help is greatly appreciated. Thanks! I have what appears to be a small cotton holder? It has two gold handles, its hand painted in haws of sage greens & lavender, trimmed in gold. It has the water mark between 1914_ (?. Sorry, forgot the ending date. Also, it is initialed L.J., in gold. Megan, it's nice to read you're doing some family research on Josef Pfeiffer. I'm trying to find some more PULS china pieces to collect. If you read this, look me up on Facebook or LinkedIn. I just wanted mention another couple of emails I had about other "Empire" pottery marks. One was from Ronaldo in the UK who mentioned this mark on some unusual wares. I couldn't really place these, so if anyone has the same or similar, please post here. Here are four examples of their markings (note: the marks are clear and always mention who they are and where they are from) . . .
how can i attach an image to my comment? Thank you! Yes, it's frustrating people can't add pictures to their comments directly. It's something technically lacking in the platform I use. I can't change platforms as I have hundreds of pages. However, I will always add your photos manually, all you need to do is get them to me. Either email me directly (giving the thread page reference link) or just post them anywhere online (flickr or photobucket) and post the links. I will transfer them over. I have a plate with the Hand painted green crown on it along with a PL stamp with a lion with a crown and it says Imperial Empire. How old is it? Hello, I'm hoping someone can tell me what the hooks that look like horns are inside my cup. The cup has a pedistal and has green, white and orange flowers and fruit on the outside, with two pretty flowers on the inside but I can't figure out what the upside down horns are for??? Hello, I'm trying to contact Megan or Manuel Kirschner. I have come across a set of either demitasse or child's set of teacups and saucers. We are antique dealers and are going to list them however would be most interested to sell them to family members who collect them and get them back into their family. My grandmother is from Germany as well and came over during the war as a war bride. If any family members are interested in these please email me at [email protected], on Facebook I am Danielle Fae Marie (from Massachusetts). They have the PULS Germany backstamp. please get in touch with me regarding the Pfeiffer family tree. I'm a great grandson of Josef Pfeiffer of Puls (Pfeiffer & Löwenstein). I have looked everywhere and cannot find the marking on the back of this little dish that has pansies painted on the outside and the inside with gold trim on the inside of the scalloped edge the marking is like a wheat edge with an arrow at the other end and there are two which cross over each other to make an X. Does anybody have any idea about any information on this little dish? Floral rimmed 9 1/4 inch plate. Can anyone tell me anything about this piece. HI Megan, Hi Manuel, my great great grandfather was Joseph Pfeiffer - and great grandfather was Adolf Pfeiffer who moved to the UK. If you would like to get in touch about family history - I am on Facebook - Carla Smith, Bristol. I have some porcelain - which I think comes from PSL. is the same. there is also the word ‘dover’. you can contact me on fb: jantien nuisman, dronrijp, the netherlands. my wife recemtly inherited family china and silver from Dobler estate. ( Dobler-Girrard pa.,Albany n,y. ) It includes several Imperial psl Austria pieces. I saw a question posed to this site about horns inside a bowl. We have a tobacco humidor bowl with such horns, where a sponge is incerted,presume its to take up moisture. Hallo, ich hoffe hier Hilfe zu finden. Habe im Erbe meiner Eltern ein 15teiliges Kaffeeservice übernommen. Der Stempel besteht aus dem Schriftzug IMPERIAL, darunter eine Art Krone und darunter Psl. Kann da jemand ein ungefähres Alter erkennen? 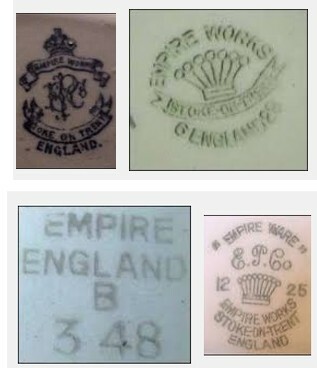 Has anyone found an answer to the Empire pottery marks. Date etc. I have two pieces with the sash on them. Large creamer and sugar I think. I can’t find it anywhere. Today, I found a lovery milk can and sugar bowl in mint condition stamped PSL Imperial La France. Is this the same firm as PSL Imperial Austria? I would love to know more about the firm. Information is much appreciated. I'm so sorry I didn't get back to this thread sooner! I literally just saw it! If you would like to get in touch please email me at la.megankane at gmail. If anyone else comes across this and has or wants more information about the family history, please reach out!